– Dairymen Work Together to Build Dairy Markets, in “Radio Scripts,” MS 65, box 6 folder 8. June is Dairy Month, which gave me an opportunity to see what material we’ve got in the stacks on dairy marketing in Iowa. The records of the Iowa State Dairy Association (MS 65) reveal how much work it takes to market dairy. Filled with sample event calendars, restaurant table displays, decoration ideas, recipes, and advertisement layouts, the annual promotional packets are excellent sources for understanding how the dairy industry sought to encourage dairy use each summer. Most Iowa dairy farms are still relatively small family operations. Despite this, Iowa farms produced 4,646,000,000 lbs of milk last year! 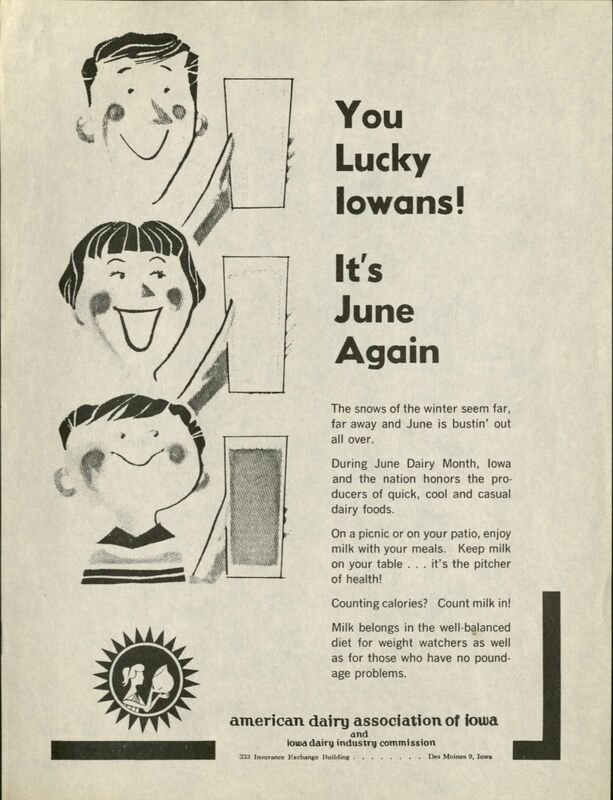 For more on Dairy Month, see last year’s blog entry and be sure to check out the other dairy marketing materials in the Iowa State Dairy Association Records. This entry was posted in Manuscript Collections and tagged dairy, dairy month, Marketing. Bookmark the permalink.